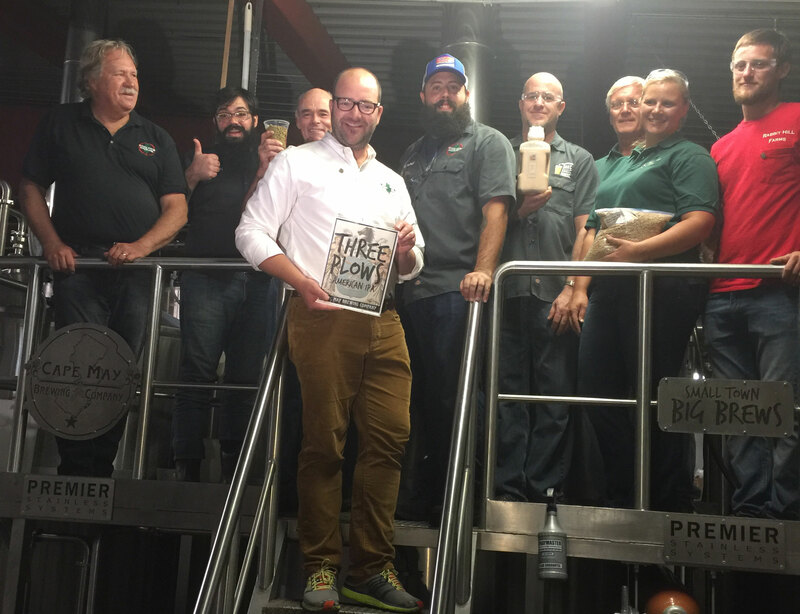 Last year, we brought you the first modern beer made with all-New Jersey ingredients: Three Plows IPA. It was truly a labor of love for us here at CMBC, and we couldn’t have been more proud with how it turned out. So, we’ve decided to do it again this year… with a twist. The ingredients are still 100% Jersey, it’s still an IPA, but it’s a completely new beer. Three Plows has a fruity and peppery yeast presence, an earthy-malty sweetness, and a pleasant, hoppy aroma flirting with a firm bitterness, yielding an IPA that is uniquely New Jersey. You want to know what the greatest thing in the world is? …are you ready for this…? It’s true. Yeast. You know it’s great for making dough rise, and we use it in our brews. It’s the greatest thing in the world, because without it there would be no alcohol. The lifecycle of a yeast basically involves eating sugar and excreting out alcohol. Sounds like a pretty decent life. We use a few different suppliers for our yeast, as well as maintaining a few of our own pitches. The yeast for Three Plows came to us from Al Buck at East Coast Yeast. Al’s been working with yeast for most of his life. He worked at a few New Jersey pharmaceutical companies, testing products and environmental monitoring, until his dissatisfaction with “corporate America” became too much to bear. And this yeast has been around for quite awhile. It was originally used at the now-defunct Ballentine Brewery, starting back in 1840. Yeast and the differences between strains is a terribly complex subject and requires a degree in microbiology to truly understand on any level. We tried to wrap our brains around it, but we came up short. Suffice it to say that different strains of yeast provide different flavors: esters or phenols. 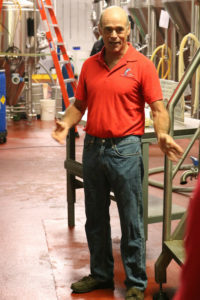 The challenges that Al faces are surprisingly similar to those faced by Mike Kane at Laughing Hops. Mike has to worry about disease overtaking his crop, and Al needs to be vigilant in keeping his lab sterile. As you probably know, yeast are single-celled organisms. They’re alive. The only way to make more yeast is by making the yeast you already have hunker down and replicate. They’re gonna do that on their own, but Al sort of helps them along with plenty of filtered oxygen and a mixture of nutrients — pretty much the same stuff we need to stay alive: amino acids, carbohydrates, and vitamins. You’ve got to keep the vessels moving, too, because if they’re stagnant they’ll fall to the bottom of the tank. Homebrewers can pick up Al’s yeast, too. On occasion, whatever us big guys don’t pick up, he’ll supply to Love2Brew out of North Brunswick. Al will be making another delivery down here — a wild yeast combination blend — so he can’t wait to hit the Tasting Room to try some Three Plows. Can you blame him? You should probably get down here, too. This historic brew won’t be around for long. You’ve been hearing about our all-New Jersey beer for a few weeks, now. If you haven’t been convinced to try this brew, we’ve got ten reasons that you need to get down to the brewery and give it a try! 10. It’s all-New Jersey, and so are you! Even if you’re not from New Jersey, this brew is going to make you wish you were. Feel free to move down here just for the brew! 9. New Jersey’s got the best ingredients in the world JUST COMING OUT OF THE GROUND. 8. You will literally be part of history. No one we know of has ever done a beer with all-New Jersey ingredients, so you’ll be part of history being made! 7. Rabbit Hill Malt. These guys know their malt. Like… KNOW their malt. They’re floor malting, which is something that hasn’t been done on a wide scale in about a hundred years. Let them know what a great job they’ve done! 6. Laughing Hops. These hops are silly. Silly with hoppy goodness, that is! And Mike Kane is just getting started — we can’t wait until his full crop comes in! 5. East Coast Yeast. The Old Newark Ale strain was used by the old Ballantine Brewery starting back in 1840. Even this yeast is historic! 4. Kirkwood-Cohansey Aquifer. This beast of a water system supplies the drinking water for over a million people in South Jersey, plus the seasonal influx of visitors, and is some of the cleanest drinking water around. 3. Director of Brewing Operations Jimmy Valm has been dreaming about an all-New Jersey brew since he moved here from Brooklyn. You don’t want to crush Jimmy’s dream, DO YOU? 2. NJ Assistant Secretary of Agriculture Al Murray is retiring soon. He’s been such a great friend to us throughout the years, and he’s ridiculously excited about this brew. The Assistant Secretary of Agriculture knows a thing or two about what comes out of the ground in New Jersey… maybe you trust his word on the thing? He’s kind of an expert. And. He’s kind of awesome. 1. It’s SO GOOD AND SO FRESH! Mike Kane is the root of Three Plows. 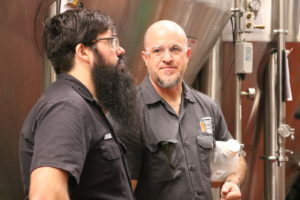 As we’ve been covering the production of this beer — indeed, even as the guys in the brewery were planning this beer — we’ve found that the major drawback to the concept of a beer brewed with entirely New Jersey ingredients has been the considerable lack of hop production in the state. Thankfully, this former union bricklayer and commercial fisherman got the wild hair of an idea to start growing some hops. After laying brick for 16 years, Mike picked up and moved to Maine. While there, he became friends with some organic farmers who turned him onto hops as a potential cash crop. So, he moved back home and bought a hay farm — Big Oaks Farm — eventually turning Laughing Hops into the largest hop yards in New Jersey. Mike’s got 15.2 acres up in Pennington, of which a little over two acres have 188 poles with glorious hop bines twisting among them. 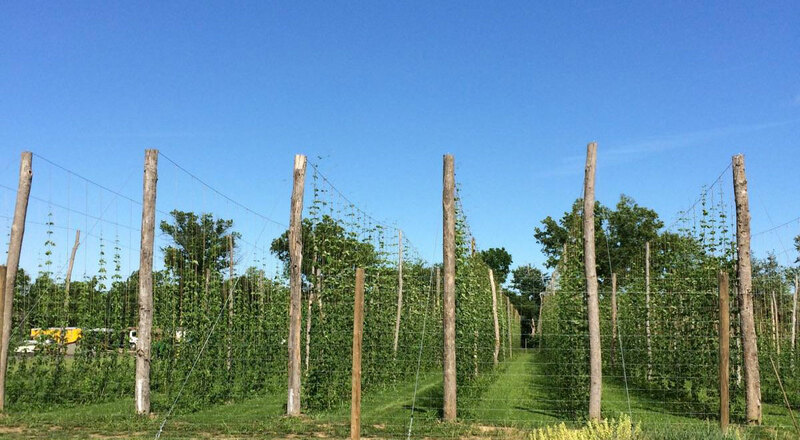 Let that sink in for a minute: the largest hop producer in the state is doing it with fewer than three acres. Growing hops is not the easiest thing in the world to do. First, the hop bines need support — if they don’t have a structure of some sort to grow on, they don’t grow. So Mike needed to get those 188 poles — and they don’t come cheap. In addition, hops are delicate little things. 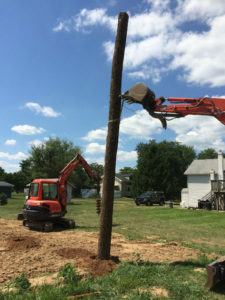 They’re susceptible to humidity-driven disease, and, as you probably know, summers in New Jersey are insanely humid — on a hot summer day, the humidity can be oppressive for a human, much less a little hop cone. Mike’s had to deal with “downy mildew” — a microbe that can be devastating to hops. Yet again, this is an understatement. 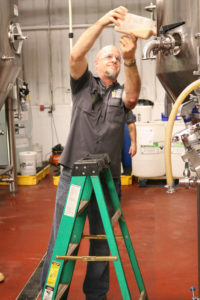 Mike should be able to produce about 2,000 pounds of hops. He got about 250 this year. Two of his five varieties of hops were completely unharvestable — his Willamette and Centennial hops were useless. (No, not the Centennials!) Nonetheless, he was able to provide us with all of the Magnum, Chinook, and Nugget we needed for this iteration of Three Plows. Furthermore, to get hops from the ground and into your delicious brew takes a lot of infrastructure. In addition to the poles, harvesting the plants from eighteen feet in the air is a challenge — Mike built his own basket/ladder combo and sets it up on a tractor. From there, the cones need to be separated from the leaves, then dried. He’s built his own driers, as well — basically little drawers with chicken wire and heaters. 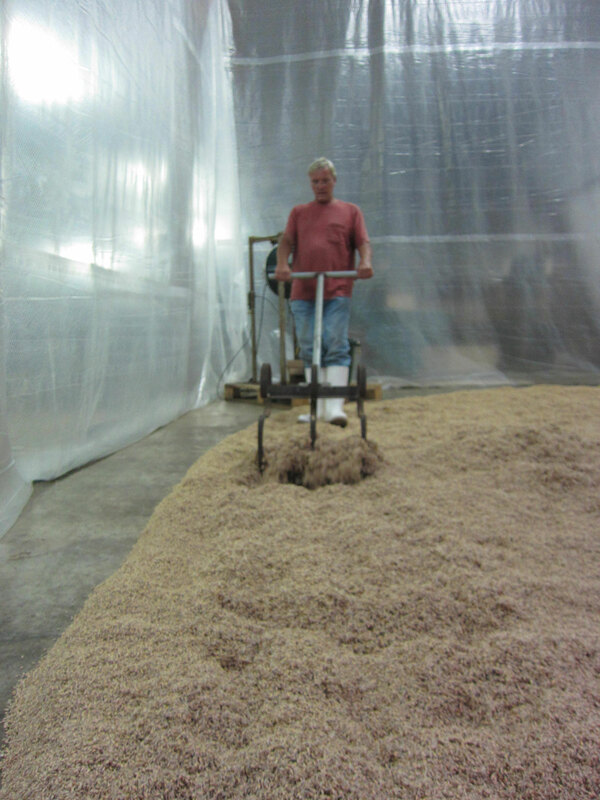 Then, they’re either vacuum packed whole and frozen or ground in a hammermill and pelletized. 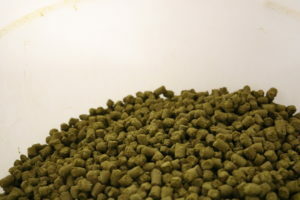 Like most breweries, we use pelletized hops. They dissolve better, you get a better hop flavor in the finished product (what we call “utilization”), and it’s easier to clean the kettle and fermenters afterwards. 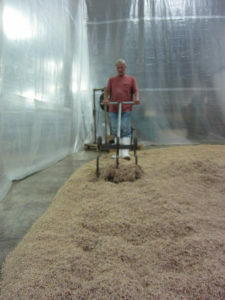 Mike is the only guy in the state with a pelletizer. Regardless of these barriers, Jersey’s making good hops. You know, you can take a tomato plant from New Jersey, bring some soil with you and move to California, but you’re still not going to get a Jersey tomato. They’ll still turn out to be those orange things you find in the supermarket in January. Same deal with hops — they take on characteristics of the area in which they grow, known as the “terroir”. Jersey just has the right combination of climate, latitude, and soil to make some extraordinary hops. Keep making them, Mike, and we’ll keep taking them. We’re loving Mike’s addition to the brew thus far, and we’re sure you’ll agree. 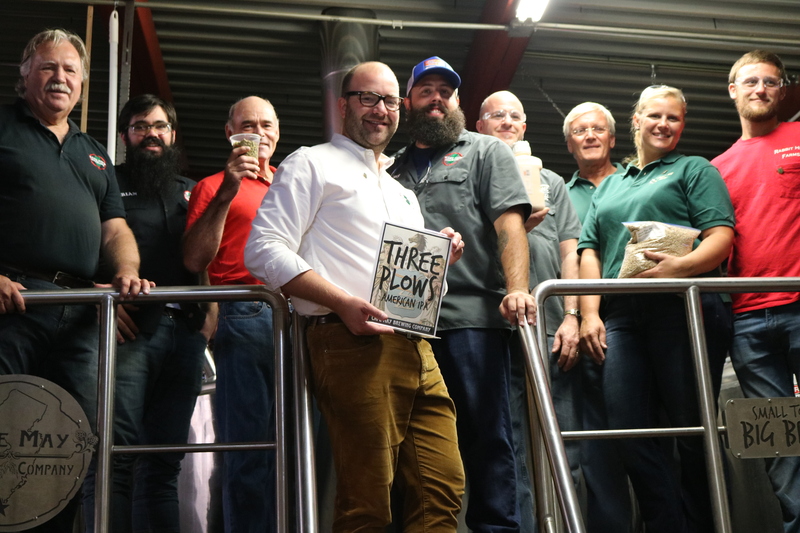 Get down to the brewery when Three Plows releases on November 10th. And if you should run into Mike, thank him. Without him, this brew would never have come to pass. It just sounds bucolic. It sounds like a place where great things are born, and where great food comes from to fill your great belly. All of that is true. And even better, it’s where great beer comes from. 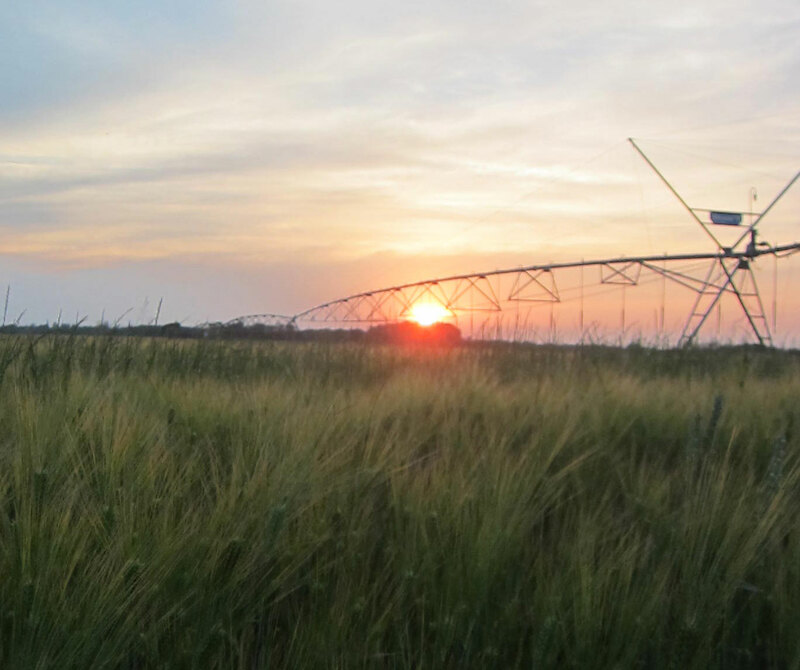 We’ve told you about Rabbit Hill before — our guys went out there over the summer to check out their barley production, and, apparently they were impressed with what they saw. So much that they’ve decided to use their barley in Three Plows. Hillary Barile is the fifth generation to be working on Rabbit Hill, and she’s thrilled that we’re using her grain in our all-New Jersey beer. “It’s a great way to explore some of the different flavors of New Jersey products,” she says. 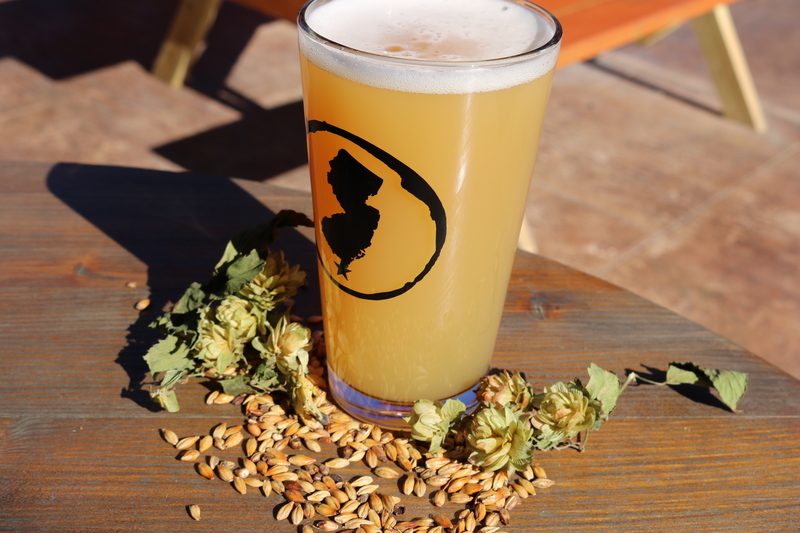 Her barley is a little different from what we might get from some of the larger companies, because the varieties of barley that are grown successfully in New Jersey are a little different from the ones they grow. And that’s quite the understatement. 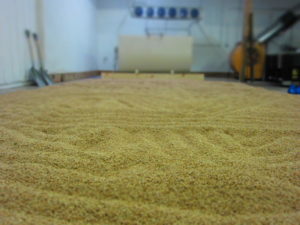 Most commonly-available malt is pneumatic malted. This means that it’s put into a vessel, and it’s steeped, germinated, and kilned all in the same vessel. Hillary, her father Abe, and her brother Blair are doing things a little differently. They’re doing what’s known as floor malting. 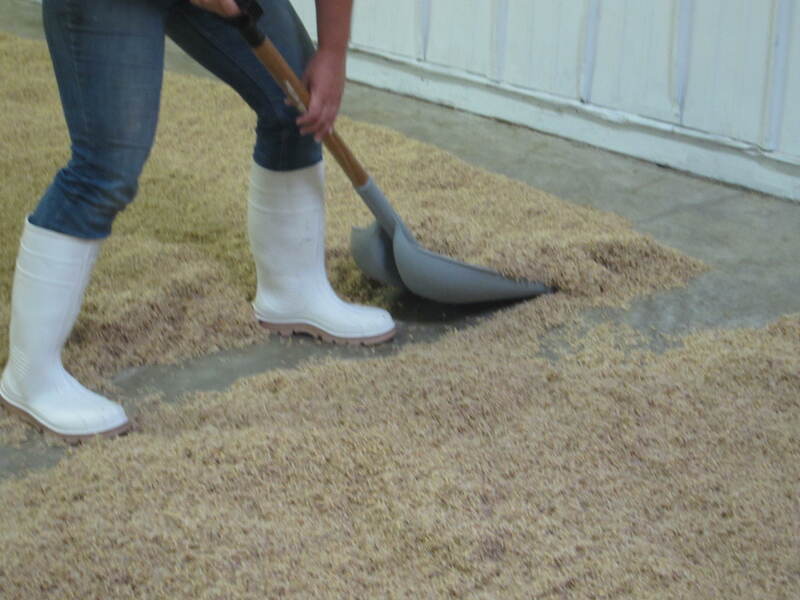 As you might imagine, floor malting takes up quite a bit of room. Hillary and her family work in one-ton batches, and once it’s spread out all over a floor, it takes up about 250 square feet. And that’s kinda what we do around here. A lot. 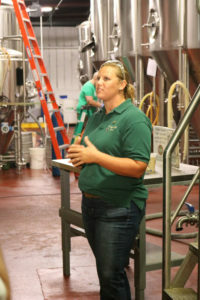 Her brother Blair, a homebrewer, has been the guinea pig from the beginning. 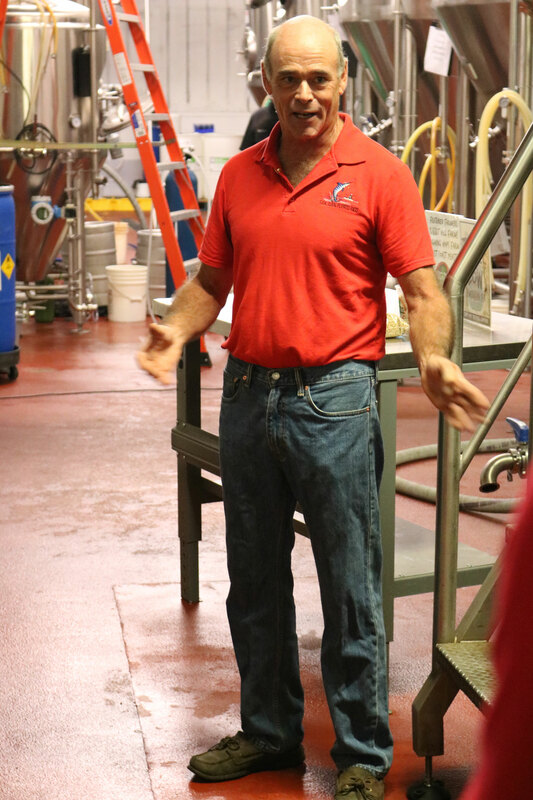 “That was where the whole idea for an all-New Jersey beer came from. Once he’d been brewing for several years, he was looking to find different ingredients. 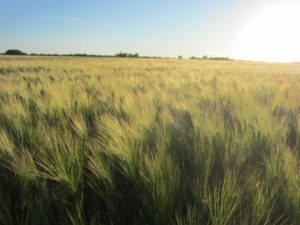 So, we thought it would be fun to brew a beer with all ingredients that we grew on our own farm.” Blair wasn’t sure if they could make malt, but Hillary was undaunted. And they did something right. Furthermore, it’s a validation of the idea they had those many years ago. “To see Cape May pick up that idea and run with it is really exciting. It validates everything we’ve been working toward for the last year and a half. So, how did Hillary and Co. do? You’ll just have to wait until November 10th to find out. 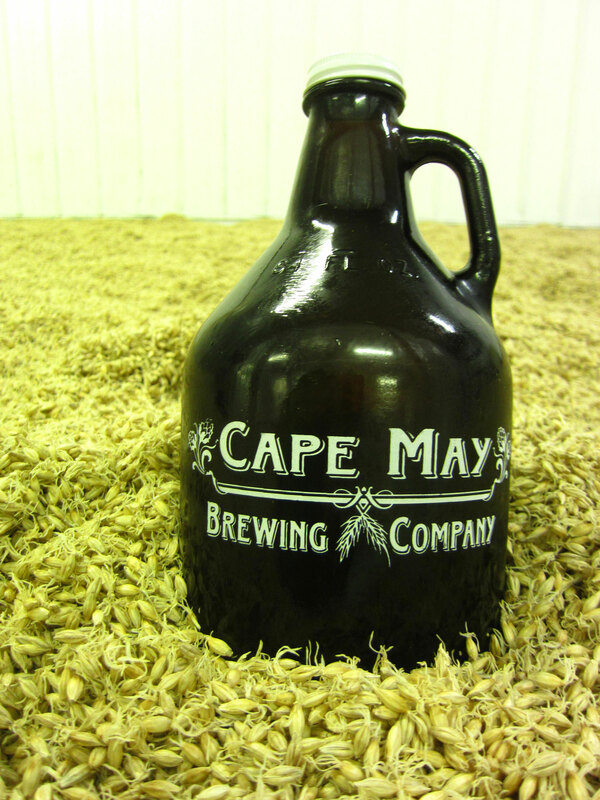 As our loyal fans already know, here at Cape May Brew Co., we love to keep things local. We contribute to causes in the local community, we sponsor events like the Exit Zero Jazz Festival and TEDx, and we send our spent grain to local farmers to feed their livestock. But, we realized early on that we can’t just talk the talk. If we’re committed to all things local, we needed some way of truly reflecting that fact. So, we wanted to find a way to showcase the plethora of agricultural products that New Jersey can produce. “It really is a great agricultural state,” said Jimmy. So, what do we do with all those great hops, yeast, and malt? 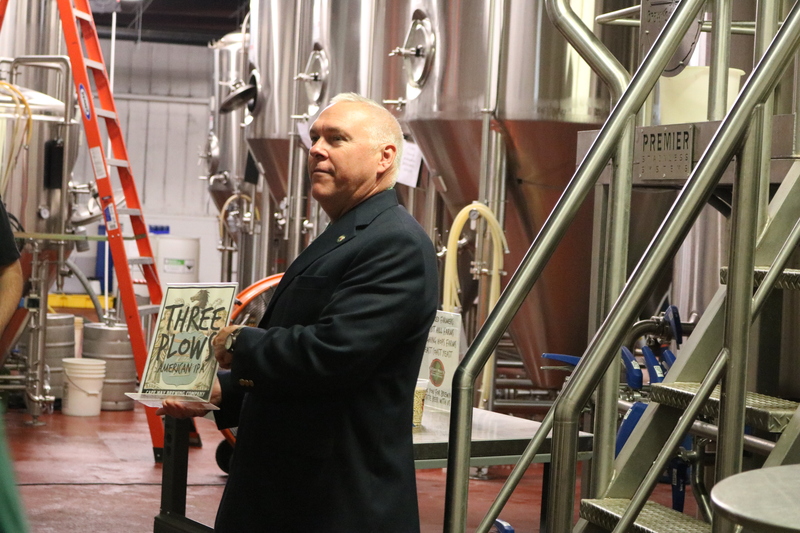 The obvious thing to do is make an all-New Jersey beer: Three Plows IPA. 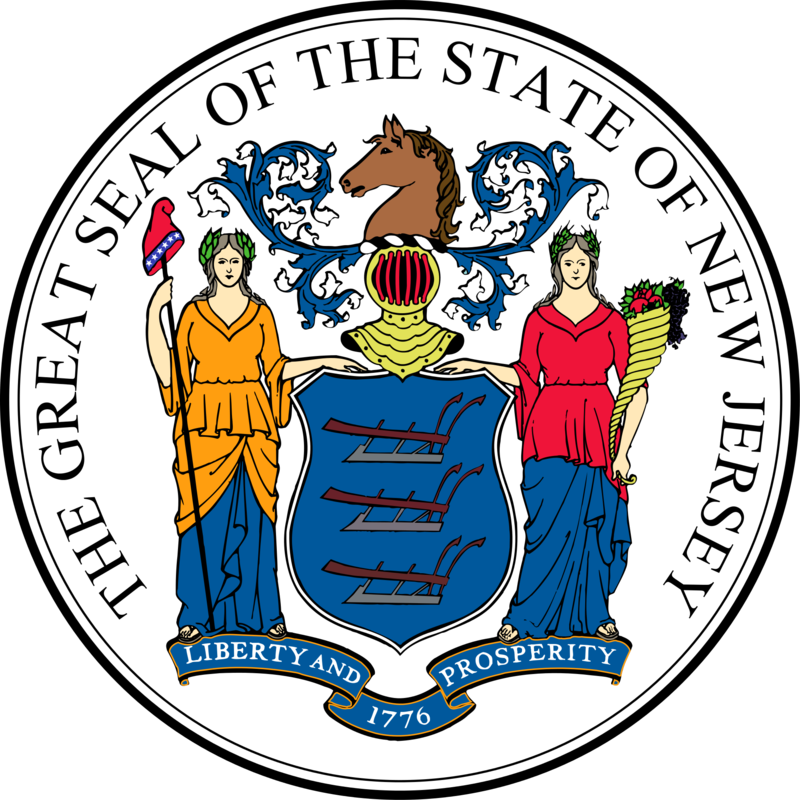 The name comes from the New Jersey State Seal. If you’ve never seen one, we were kind enough to put one up here for you. In addition to a few other elements — including a Godfather-esque horse’s head — there’s a blue shield in the middle of the crest with three plows emblazoned on it. These plows represent not only New Jersey’s reputation as an agricultural powerhouse, but also our Order of Statehood: New Jersey was the third state, just behind Delaware and Pennsylvania. Last Thursday — on a decidedly spring-like day in the middle of October — we began brewing this beer. And to mark the event, we had representatives from the farms, the lab, and the Department of Agriculture down to the brewery to lend a hand. 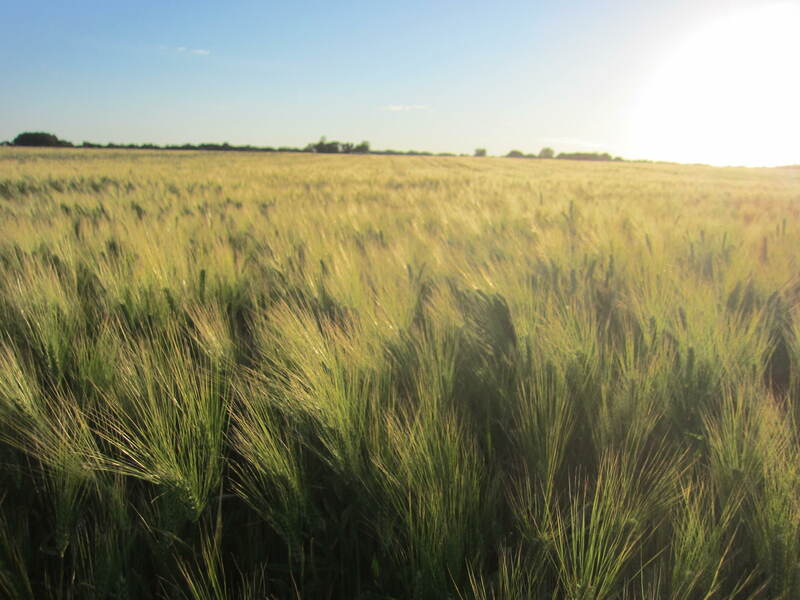 Our production staff visited Rabbit Hill over the summer to check out their barley fields, and that’s where the idea for an all-New Jersey beer really started to form. The original plan — and hopefully the plan for the future — was to make it a year-round offering, but there was one small hitch: there weren’t enough hops in the entire state of New Jersey to be able to pull that off. Not only did we need New Jersey hops, but we also needed someone who was pelletizing hops, as well. So, hunting down enough hops even to do it once was a bit of a trial, but Hillary was determined to make it happen. It’s a little-known fact how much Rutgers University has to do with the agricultural community in New Jersey. They’re a brawny school — known as much for academics as athletics — but their Agricultural Extension has offices in every agricultural county in New Jersey, and they work behind the scenes to coordinate production throughout the state. Hillary contacted them, who put her in touch with Mike Kane at Laughing Hops Farm. This is only Mike’s second year growing hops. They’re a notoriously finicky crop — it usually takes a few years to get a real harvest. His first year only yielded him a few pounds, but this time around he was able to get us what we needed. 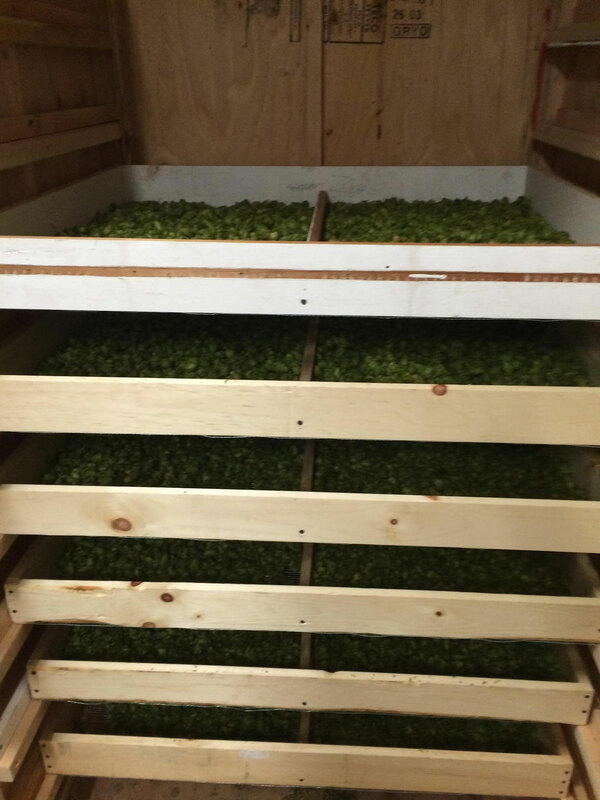 “This year was my first real test of equipment and hops-growing. It’s a little challenging, but it’s definitely interesting,” Mike tells us. Regardless, he was able to provide us with the Nugget, Chinook, and Magnum hops we’re using in this brew. Thankfully, we’ve already had a successful relationship with a New Jersey lab for yeast. East Coast Yeast, headed by Al Buck, supplied us with the various yeasts used in the Barrel Aged Series. As you may remember, that series has been almost three years in the making, so we’ve known Al for quite awhile. Al had worked for several pharmaceutical companies before he decided to open his own lab. He’s been homebrewing for about fifteen years, so he really knows his stuff. The yeast we’re using in Three Plows was originally used at the Ballantine Brewery in Newark as their ale pitching yeast. “It gives it a slight ester, a little bit of a fruity profile, very reminiscent of an English- or British-style ale,” Al tells us. Secretary Murray points to Rabbit Hill Farms as exemplifying that adaptation. 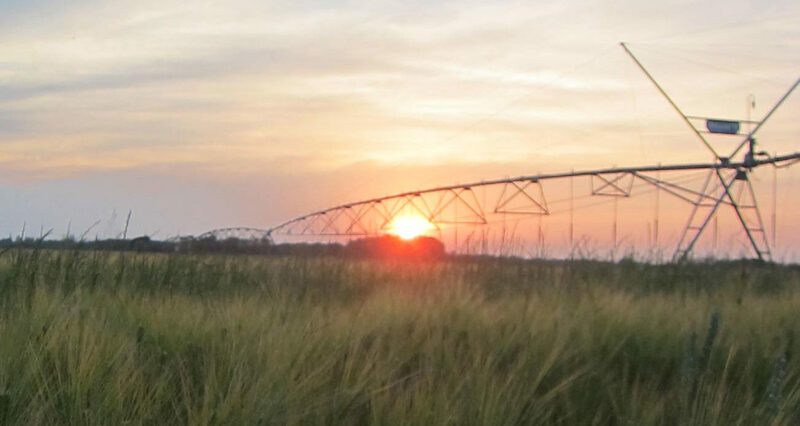 Rabbit Hill was a potato grower for many generations, but, as the crop became less profitable, they found new life in a value-added product like malted barley. 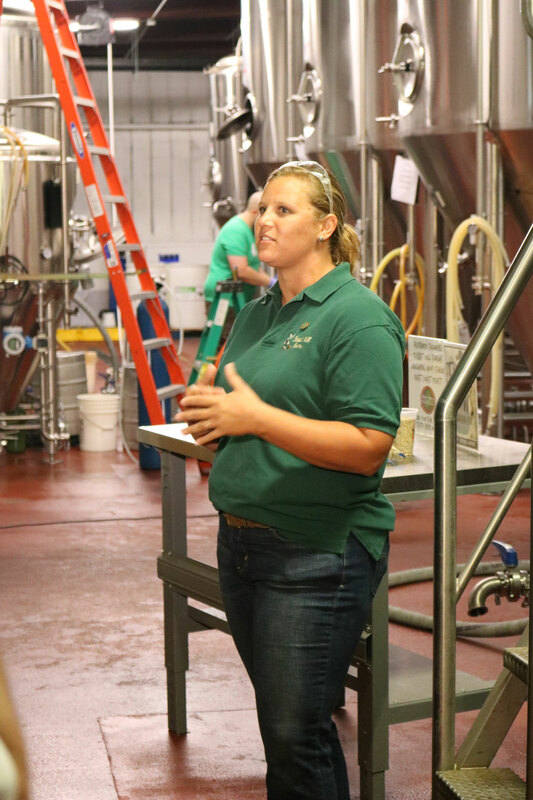 “They’ve totally repurposed their farm and moved away from potatoes and growing a support crop for the brewery,” Secretary Murray says. Hopefully, something like Three Plows will spur more New Jersey farmers to start growing hops. Before Prohibition, New York state was the center of hops production in the country. Now, that industry has moved out west to Oregon and the Pacific Northwest. The humid climate in New Jersey isn’t the best for hops, but farmers have been overcoming that to grow other crops resistant to humidity, like basil. 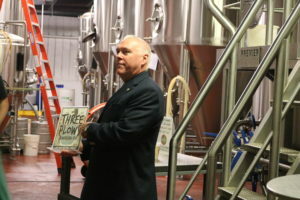 As for the future of hops farming in New Jersey, “during my tenure in the Department of Agriculture, once a farmer starts making some money on something, everybody’s going to be doing it,” Secretary Murray jokes. 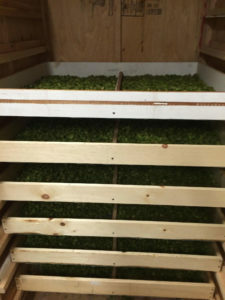 Interest in farming hops has been growing in the past few years. Each February, there’s the New Jersey Vegetable Grower’s Convention in Atlantic City. They have various sessions on different crops — corn, peppers, tomatoes, etc. That’s great news for us and, ultimately, great news for you. We think Three Plows is going to help grow interest in hops production. Hopefully, we’ll continue to use the great products from Rabbit Hill, Laughing Hops, and East Coast Yeast in other brews. Jimmy says that Rabbit Hill is “doing great stuff.” He’ll probably be using more of East Coast Yeast’s products in the Barrel Aged Series, as they continue working on great things with Brett, Lacto, and Pedio cultures. And hopefully we’ll get some fresh hops from Laughing Hill. 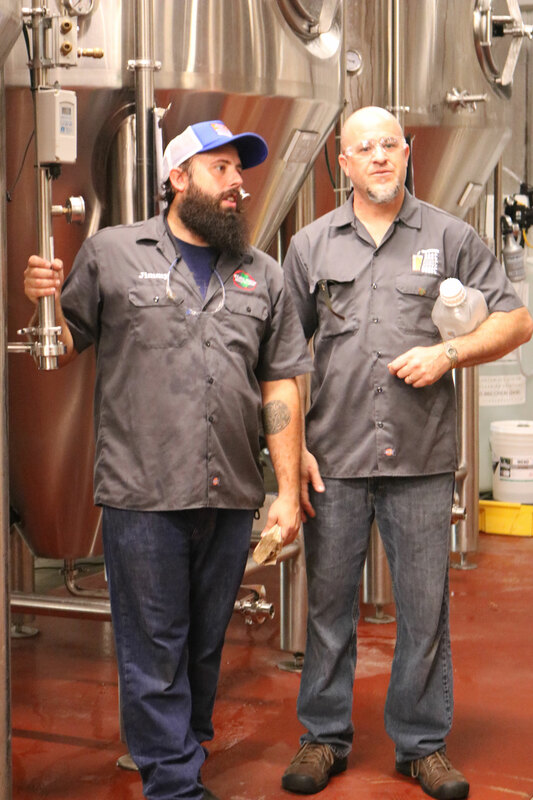 “We want to get some fresh-hopping and wet-hopping going on,” Jimmy says. Hillary from Rabbit Hill is looking forward to the finished product. “I think that the interest in having things that are produced locally and with local ingredients is really growing,” Hillary says, “and it seems to me to be common sense to be able to provide that and have something that’s a source of state pride. We tend to agree with Hillary, but it’s up to you guys to decide. We’ll be releasing Three Plows from the Tasting Room on November 10. Mark your calendars: you’re not going to want to miss this one. You know how we love sourcing local at CMBC, right? “Drink Local” — it’s kinda how we base our entire business model. It’s how we ensure that we’ve got the freshest ingredients possible, and we get to give a little back to the businesses and farmers who have given us so much. This time around, we’re taking it to a whole new level. Three Plows is ultra, insanely, ludicrously local. The yeast, malt, and hops for this magically delicious IPA all come from the Great State of New Jersey. We had a great event at the brewhouse in HQ at 10 am Thursday. Representing the New Jersey Department of Agriculture, Assistant Secretary Al Murray was on hand, as well as representatives from the farms and the lab. Everyone played an active role to brew this beer: pitching yeast, adding hops, and graining out. The Cape May County Gazette stopped by to document the event, VisitSouthJersey.com was there, and SNJ Today’s report will air tonight. It was a great day! We’ll have the full story of what went down next week, as well as all of the great deets on this brew. Be sure to check back!